Loving Lord, today as we recall the presentation of Jesus in the Temple, and the beginnings of a life of love and service to all men and women, we open our hearts and minds to Him and bring our cares and concerns for your world and your people. Our world is marked out by greed and selfishness and by the inhumanity which is so much part of our lives and those of every body around us. Help us to learn how to put the needs of others more firmly before our own. May those who exercise power and authority in out communities use it wisely, and may we, and they, serve the Lord with gladness. The world into which Jesus was born was like our own, divided by war and pestilence. We read daily or see or hear news of fighting in so many places. We are glad that there is now an armistice in Gaza and Israel, praying that the green shoots of hope may blossom into a lasting peace. But we remember all those other countries, known and unknown where fighting is part and parcel of daily life. We ask for peace in those places and that we may be peacemakers wherever we can. Jesus came into our world bringing your promises of grace and freedom for all of us. We rejoice in the great body of people who form your church and to whom we are glad to belong. 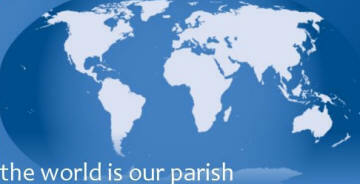 We pray for Christians everywhere and especially for all those who follow You in this part of Bedford. Bless the work of our ministers and leaders and help us all, in home, work and leisure, to be clear witnesses of Jesus’ life. The light given off by a candle reminds us that Jesus is the light of the world. We light our candle to remind ourselves of Him and especially those who have died and gone before us. We remember them and those who mourn them. May the souls of all the faithful departed, through the mercy of God, rest in peace and rise in glory. We pray in the quietness of our minds for all who we know have need of You. Those who are sick , in hospital; those who are badly affected by the present financial trouble, those who are lonely or depressed, those who have no family help. Bless them and give them comfort and assurance, and give us courage to do what we can to help.. Give your grace and strength to all whose life is built round caring for others. We say together the prayer that Jesus taught us.